Our son Finn was just three months old when he was diagnosed with rhabdomyosarcoma, an aggressive and fast-growing sarcoma. We spent the first year of his life fighting for it. It was so unreal because Finn was so little. It was like a slap in the face and it just kept hitting us hard and fast—surgery, cancer, chemotherapy. There was no time to think or feel. We were in full survival mode. 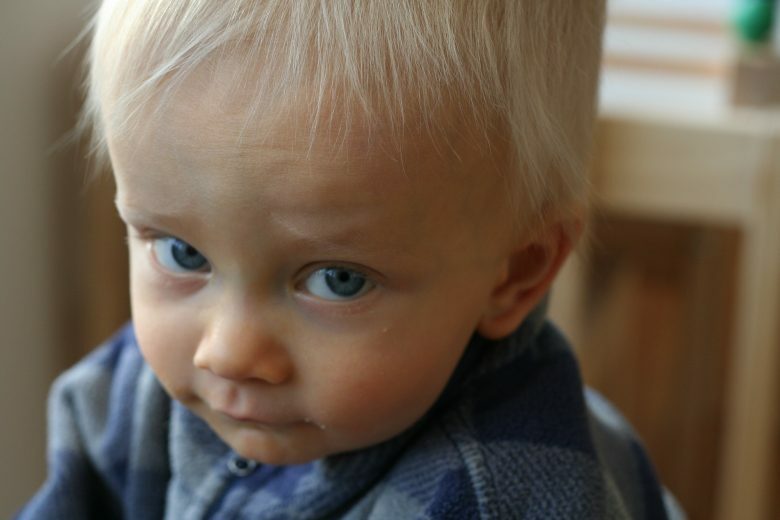 The cancer, in Finn’s case, was caused by another condition called neurofibromatosis type 1 (NF1), which causes tumours to form on the nerve tissue. Again, we had no time to process this news at all. Our little boy was fighting for his life. 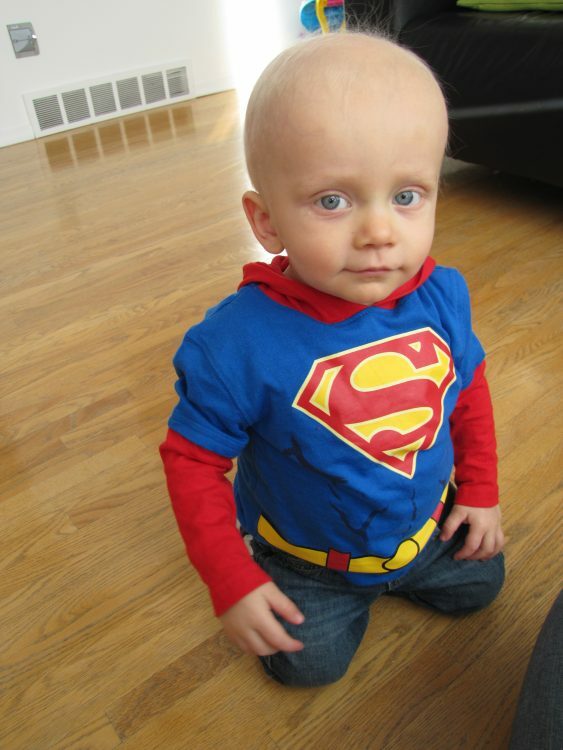 Early in his cancer journey, Finn earned the nickname SuperFinn. 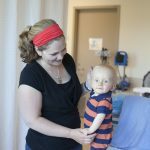 Not even a year old and the only world he knew was cancer — needles, central lines, chemo ports, dressing changes and hospital stays. Our only reference point was a cheerful, but very sick little boy in need of constant medical care. Finn instantly earned the well-deserved nickname — SuperFinn. 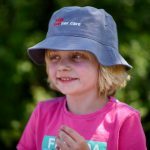 In the frightening and clinical world of childhood cancer, my husband Martijn and I discovered Kids Cancer Care. We got our first real break at their spring Family Camp. At first we were hesitant. 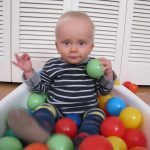 We were only about five weeks into Finn’s treatment and I think we were just terrified of the idea of committing ourselves to this cancer community. It seemed like such a final stand, so absolute. In the end, we decided it would be good to connect with others on this path, so we packed our bags for the weekend and headed out to Camp Kindle. We had a fantastic time at camp! It was so well organized and the staff and volunteers were amazing. Finn was undergoing chemotherapy at this time, so he was sick for most of the weekend. Finn and I spent a lot of time in the Re-Kindle Clinic, where the volunteer nurses administered chemotherapy and TLC to him 24/7. They were so wonderful. 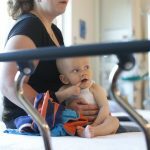 One evening, the nursing volunteers actually sat on the floor by Finn’s bed, while he was sleeping, so we could join the other parents in the evening activities. It was an amazing break for us. Aside from the initial jitters we felt while formally introducing ourselves to the other families the first evening, the entire experience was about relaxation and fun — building birdhouses, enjoying meals with other parents, hiking trips and drumming circles. After Family Camp, we became instant regulars. We started going to all the events at Camp Kindle — Mother’s Day Brunch, Survivor Day. The people we met at this first camp are still friends to this date, almost six years later. Another checkup for Finn at the hospital. Childhood cancer can be such a lonely and isolating experience. I think people can underestimate the impact of forced isolation on the child and the family. You’re literally housebound because visiting a grocery store or meeting a coughing child, as you come around the corner, can be fatal. Kids Cancer Care programs were the only thing we could do. Finn is turning six years old this month and he just started kindergarten. 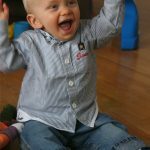 Although he is no longer on active treatment, he is monitored regularly for tumour growth and other NF1-related complications. 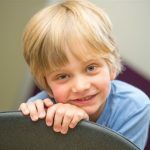 As with most children affected by childhood cancer, he is facing a lifetime of complicated health issues related to the treatments that saved his life. To manage the long-term side effects, Finn sees a battalion of medical specialists — from pediatric oncologists and neurologists to geneticists, endocrinologists, orthopedic surgeons, ophthalmologists, dermatologists, physiotherapists, occupational therapists and more. Thank goodness for Kids Cancer Care. 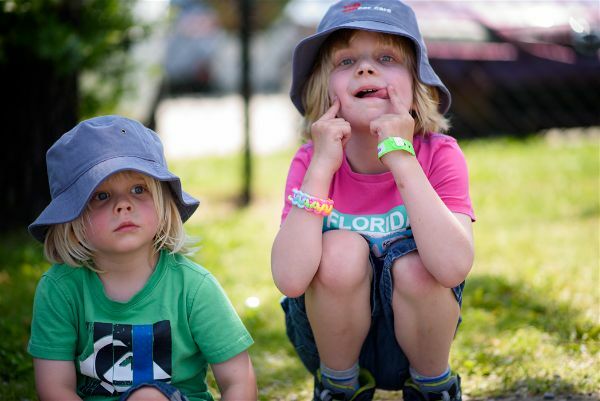 Finn and his little brother Bodi enjoy a range of Kids Cancer Care programs. And they love them all. When I ask Finn about Kids Cancer Care, he says, “Kids Cancer Care is fun.” Our little man of few words. Last summer was Finn’s third year of camp and Bodi’s first year of camp. To attend camp, kids have to be at least three years old and Bodi was beyond happy to finally join his big brother Finn at camp. For months leading up to camp, the boys were constantly chatting about camp and what they would do while there. Both boys had an amazing time. Finn was assigned a one-to-one volunteer aide, who also took Bodi on. They had a fantastic week. Both boys are also frequent participants in Kids Cancer Care’s PEER program. 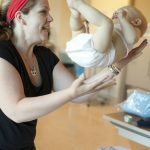 PEER stands for Pediatric Oncology Patients Engaging in Exercise for Recovery and it is a customized exercise program that helps reduce the deconditioning effects of cancer in children. These weekly sessions are amazing for developing their motor skills, balance, flexibility, muscle and cardio strength. They also help build their confidence. Finn has benefitted so much from this program as they also work on his physio needs at PEER. One of Finn’s heroes, also known as Coach Liam, played a huge role in his progress. Every week, Coach Liam and Finn would work and play together during PEER. Over the months, they built a wonderful bond together. Finn loves to race and challenges every coach at PEER to race with him. Finn also loves to swim and ride his bicycle. In his downtime at home, he loves to play with Hot Wheels and Lego. He also loves to read books. Finn is always curious and always asking questions. He is always ready to learn. L-R Bodi and Finn at SunRise camp. I don’t know what we would do without Kids Cancer Care. The staff and volunteers at Kids Cancer Care truly care. 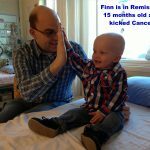 The support we have received from day one has been incredible — a freezer filled with food during treatment; family camps where nurses cared for Finn, so we could get a break; exercise programs tailored to help Finn manage the late effects of his treatment; and parent education programs and more. 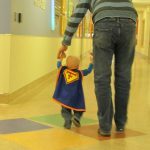 At Kids Cancer Care, we have found a community of support with people who get it. Thank you for making these programs possible. Finn and his mother Inge. Finn and his dad Martijn.